Can Your Diet Epigenetically Shape Your Child’s Health? | What is Epigenetics? Have you ever heard the old saying “you are what you eat?” This is not just an expression anymore, as scientists have discovered that we are what we eat and possibly even what our parents or grandparents ate. Besides a mom’s eating patterns, other factors like stress, GDM (gestational diabetes mellitus), and smoking or drinking alcohol during gestation can have deep effects on the unborn child. It can affect his or her susceptibility to chronic diseases as an adult. 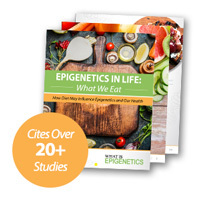 In other words, epigenetics may help explain how early nutrition and environmental exposure programs long-term health. Obesity is the result of a combination of multiple and complex factors that act all throughout a person’s life, however, recent evidence suggests that several early-life factors play a big role in the development of childhood obesity. Epigenetics has especially been linked to obesity in recent studies. Experimental studies have found that a diet with too little methyl-donors before or during pregnancy, or just after birth causes certain regions of the genome to be under-methylated for life, with the detrimental consequence for health. Epigenetics is a vast science that gives us a new perspective on the origins and early development of disease. It also opens our eyes to create novel approaches to treat chronic disorders and takes a step forward on the traditional management of them. If many of these illnesses have their origins within the maternal environment we, therefore, should aim to provide women the necessary resources for a successful and healthy pregnancy. Regarding nutrition, we should encourage women to follow a well-balanced diet, which includes adequate amounts of energy, protein, and micronutrients. It is important to discuss a proper diet with your doctor and consult with a professional if you are interested in learning what may be consumed to have a potentially positive epigenetic modification on the offspring. Ensuring these healthier environments will lead us to healthier future generations. Janeth Santiago Rios is a dietitian-nutritionist from Colombia with an MSc in Nutrition and Metabolism from Barcelona and Rovira i Virgili University. Janeth is passionate about healthy eating, writing, and helping others improve their quality of life through nutrition.